Well, it’s done and dusted for another year. Our Annual Yarn Fete was a huge success! Thanks to everyone who came, looked and purchased from our suppliers on the day. A big thankyou to our Suppliers who continue to support us in this event. We had an amazing day with record numbers and a lot of happy customers. You can see some photos from the day here. 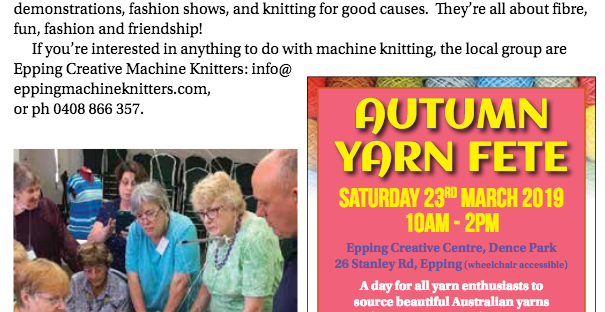 Our Annual Yarn Fete (previously known as the Traders Day) is coming up on the 23rd March, and we have been given a small editorial in the local Monthly Chronicle! You can see a digital edition here (page 7). Then come along to our Annual Autumn Yarn Fete on 23rd March. A day of colour and fabulous fibres from Indie Producers and Other Suppliers throughout NSW and beyond. You’ll find Australian wool, Alpaca, silk, hand dyed, hand spun and even fibres sourced and named from the individual alpaca. There’s also Machine Knitting parts, accessories and spongebars refubished on the day. For more details go to the Autumn Yarn Fete! Previously named our Traders Day, we are taking a fresh approach to a timeless craft! If you do, come along to our Annual Members Day (open to the public) which showcases the talents of our amazing machine knitters, and includes a fashion parade by the Illawarra Machine Knitters. It’s not too late to register to come along to our 3rd live-in/knit-in-weekend! Located in the lovely St Joseph’s in Kincumber, it is a great opportunity to tackle a project, learn a new technique, be inspired and catchup with fellow knitters from near and far. Email or post your registration using the: 2018 Live In Registration Form. August will be our half yearly general meeting with a twist. This year we’ve moved our Live-In-Weekend to St Joseph’s in Kincumber South. It’s a great time away to meet fellow knitters and knit away. 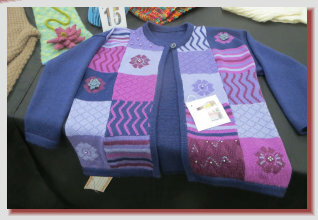 Macknit have a booth at the Sydney Craft & Quilt Fair from 20th to 24th June. Come along for a chat, some inspiration from fellow knitters, as well as seeing the amazing quilts on display. Come and say hello to some of our talented Newcastle members at Newcastle Craft Alive, 20-22nd April, Newcastle Racecourse.